The goals of the ALMI lecture are to understand asset and liability management strategies used in insurance companies, and to understand the new Solvency II insurance regulatory rules. The contents of the ALMI lecture are separated into three categories: Liability Management, Asset Management, and Asset Liability Management and Solvency II. The first part – Liability Management – focuses on topics such as risk pooling, insurance pricing, estimation of reserves, risk sharing, reinsurance, alternative risk transfer, and capital management. Students are supposed to understand the sources of risks in insurance companies, and to learn techniques to measure and limit these risks. For the Asset Management part, the lecture applies classic pricing methods as well as performance measurements to the insurance context. Specifically, in this part students are expected to practice knowledge such as Markowitz Diversification, CAPM, Performance Measurements, and Dynamic Financial Analysis. In addition, the second part offers insights into the regulatory framework for insurers’ investment policies. The last part – Asset Liability Management – integrates both asset management and liability management strategies to arrive at an integrated risk management of insurance companies. It aims to help students understand the motivation and importance of conducting ALM, and to further equip students with methodologies such as simultaneous and classic modeling based on the Markowitz approach. Furthermore, policyholders’ reactions on the default risks of insurers are also incorporated as one of the topics. We also discuss the envisaged Solvency II regulatory regime and its implications for ALM. Insurance companies play a vital role: for individuals that seek to decrease uncertainty of wealth, for businesses that want to manage business risk, for the real economy by providing funds and pooling risks, and for the financial market by being important counterparties in numerous financial transactions. In this course we will shed light on these different roles of insurance companies. We will compare the implications for different stakeholders and (insurance) markets in general. In the first part of the course, we will provide the basics for understanding the different roles of insurance companies, that include the microeconomics of insurance demand and information asymmetries in insurance markets, the specifics of life insurance and its regulation, the relation between economic growth and insurance penetration, the behavior of insurers as asset investors, and the relation between financial crises and insurance companies. In the second part of the course, participants will present research papers that examine specific details about these different roles of insurance companies. Based on their presentation, participants are required to hand in a written homework about the policy implications of the presented research. The essence of insurance and its delimitation from other financial activities. The analytical foundation of insurance: risk and uncertainty; adverse selection and moral hazard; mutualisation, diversification and the law of large numbers. Interaction of insurance with the economy and the financial system: the economic and financial role of insurance. The role of capital, liquidity and leverage. Insurance products, services and markets: a brief overview. The regulation of insurance at European and international level: key policy issues. This course is relevant for students who have a keen and comprehensive interest in finance, financial stability and financial regulation and who are aware that focusing on the banking system alone covers only part of the relevant issues in the area. 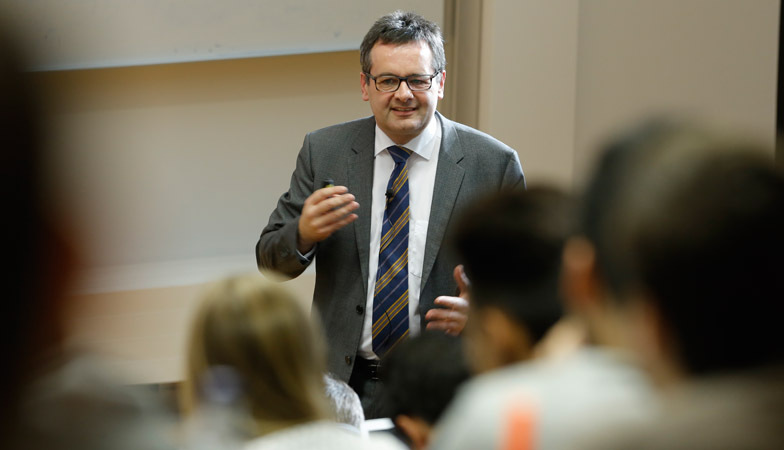 The course is also relevant for students with a macro economic interest who want to understand the key role of long-term savings and investment and the stabilisation this also has for reducing short-term uncertainty. And finally, the course is interesting for students who like to work in the financial sector in the future. The objective of the lecture is to understand the fundamental concept of insurance as well as the delineation between individual and social insurance. Moreover, selected insurance products are to be introduced from the non-life (motor vehicle insurance, building insurance), life insurance and health insurance segments. The calculations used for the various insurance products are dealt with in detail. The sales policy of an insurance company represents a further focal point of the module. In the process, the sales strategies and sales policy instruments of insurance companies are presented, followed by a discussion of their respective benefits and drawbacks. Students are enabled to understand the fundamental concept of insurance along with the clear delineation between individual and social insurance systems. They acquire an overview of the large variety of insurance products available and receive an in-depth insight into selected insurance products from the non-life, life and health insurance segments. They develop a firm command of quantitative methods of insurance calculation and receive an insight into distribution policy of the insurance industry and are to understand the benefits and drawbacks of various distribution channels. The objective of the seminar is to build on the knowledge acquired in the bachelor seminar on European Insurance Regulation. Students are required to research a specific topic, to report about their research and to discuss the results of the research with their fellow students. As opposed to the bachelor seminar, the topics in the master seminar will have to be researched on a comparative basis. The topics will be provided in advance and will relate to issues such as the ORSA, key governance functions, assessment of fit and proper requirement for key function holders, internal model approval, market conduct issues, insurance distribution, etc.